Pollinators, such as bees and butterflies, have been present in the news in recent-years—but for all the wrong reasons. Pollinators in general are undergoing startling declines. As well as this being a disaster for our biodiversity, the loss of the millions of pounds worth of work pollinators do would spell serious trouble for the human race. 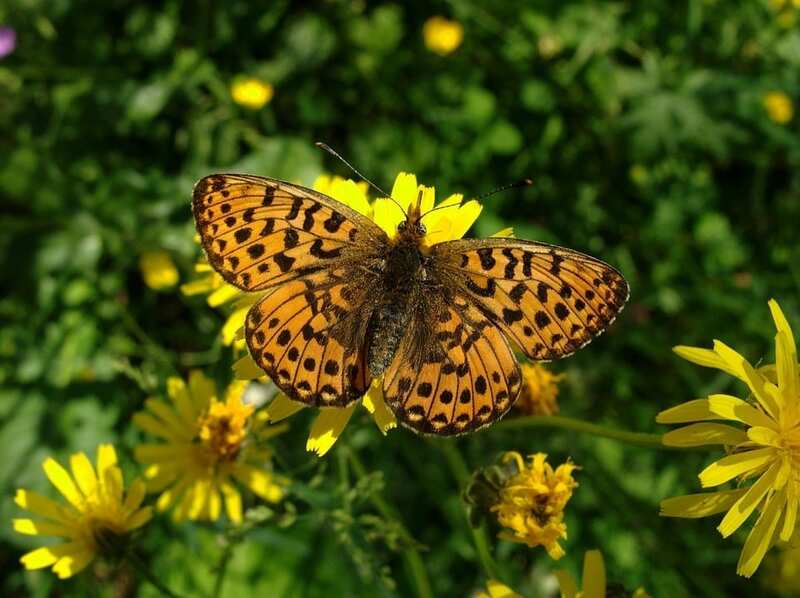 One of Britain’s most endangered pollinators, and indeed species, is the pearl-bordered fritillary butterfly (Boloria euphrosyne). There are very few, scattered populations in the UK today, and they are found mainly in south-west England and Wales, running in a line between Denbighshire and Kent. There are also significant populations in Scotland. Pearl-bordered fritillaries are woodland butterflies. Their most common habitat is in coppiced woodland, open scrub and light deciduous wood-pasture. Coppicing is less widely practised now than it once was, and this is believed to be a major factor in their decline. The use of pesticides and intensive farming, loss of open spaces in woodlands, and poor habitat management are others. Estimations place the amount of decline as between 61-90% in Britain since the mid-seventies. Pearl-bordered fritillaries are resplendently decked out in autumnal orange and browns. The underside of the hind wings are patterned along their edges with pearl-coloured scallops and two larger ‘pearls’, that give the butterfly their common name. The butterflies herald the coming of spring as one of the first butterflies to emerge, toward the end of April or in May. They are in flight for about six weeks. They mate during this time. After feeding, usually on early spring flowers such as bugle, dandelion, and lesser celandine, males fly low and swiftly across the breeding site looking for a mate. Once he has found a virgin female, they will mate for around 30 minutes. During mating they are usually camouflaged well against the bracken dominated vegetation that makes up their usual breeding sites. Like all butterflies, pearl-bordered fritillaries go through different stages of metamorphosis as a caterpillar, pupa and butterfly. In spring after mating, the female will lay her eggs on dead bracken or leaf litter. She will normally do this close to, or even on, foodplants, commonly common dog-violet, heath dog-violet or marsh violet. Eggs hatch after around two weeks, and the caterpillar will moult five times, growing each time. The phases between moults are known as instars. The caterpillar hibernates for winter after its first moult, waking to eat again in March and April, before undergoing pupation. Pupation occurs in leaf litter or low vegetation, and all the caterpillars’ organs dissolve, filling the pupa with liquid, from which the adult butterfly will grow. This fascinating process seems almost magical, and so marries well with butterflies’ association with otherworldly places and paradises. Llyn Cwn Llwch in south Wales is said to be the site of magical fairy door behind which is the world of the tylwyth teg. Those lucky enough to find it are transported to a bounteous garden, hanging with sumptuous fruits, filled with beautiful flowers and inhabited by musical birds and an abundance of colourful butterflies. The metamorphosis of butterflies has made them a popular symbol of re-birth and spiritual transformation in many cultures, and in Irish mythology butterflies are the souls of the dead, making the journey from the physical realm to the otherworld. Aristotle gave butterflies the name psyche, which means human soul. Their association with rebirth is perhaps a pertinent reminder to transform our own species’ destructive ways.